I haven't forgotten about my own bloghop, but I've been hit with a migraine this morning that's basically thrown my whole schedule out. As such, I'm going to postpone my post to Monday. I've been really quiet. Mostly I just needed a break. The events of the past two weeks just really brought me to a brink I didn't like being on. A kind of mute terror that nothing would ever be okay again. And no, I'm not being dramatic. One day, I might actually write about this time here, but if you'd like to know exactly what's going on, I have a post about it on my Patreon feed, which you can get to (as well as some awesome rewards) for a $1 subscription pledge. Eek. That looks like a plug. It's really not. I don't like keeping secrets from you guys, but what's going on right now is so ugly that I can't just post it out in public. Patreon is a balance of both, offering easy access to those who really want to know while keeping it relatively private so it can't just come up whenever someone searches my name. Sometimes, it's really hard, almost impossible to do that. Especially when I've been knocked down and back so many times that I'm about a hair's breadth away from losing all faith in humanity. Because the most frustrating thing about all this is that I didn't put myself here. But I have to get out somehow and I can't do that if I keep wallowing in the rage I feel toward the growing list of people who've wronged me and those I love. I can't get out if I don't have hope that one day, something I or someone in my family did will pan out. I also can't do it if I'm snowing myself under with a laundry list of expectations when some days, just the act of getting up for the day feels like a chore. So now I'm going back to basics. If I feel like I'm too burned out to write, I don't write. I've scrapped my publishing deadline for Book 3 because it's already too close and I really don't need the extra pressure. I'm putting in more time with my freelance work which, while still not quite in the "it's taken off" category, still is doing well enough to give me hope that it will take off in the near future. I'm cutting out as much negativity as I can. This means willing myself not to dwell on the past, and particularly not this most recent thing. I let myself feel them, but then I remind myself I have to move on and do that instead. But also, I've found that the Trump election has turned a lot of people in my social networks (on all sides of the political divide) into toxic people to have contact with. So I'm culling them out of my feed. It's nothing personal, but for the sake of my own well-being, I'm doing what I must in order to keep myself in as good an emotional shape as I can. It's already helped too. Because here I am, writing when on IWSG day I could barely even type out a sentence without crying. Still somehow alive and kicking, although part of me doesn't feel like that. But... you know... keeping on keeping on. As part of that, I decided to take part in the Writer's Life for Me Tag, and since I got tagged on YouTube, I thought I'd do it as a vlog. I thought things couldn't go worse. 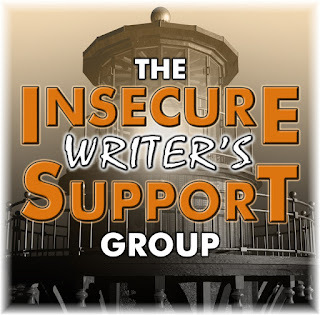 The Insecure Writer's Support Group is a monthly bloghop taking place on the first Wednesday of every month. About two hundred writers are part of the IWSG, sharing our doubt, fears, insecurities and encouragement to let everyone else know that actually, they're not all that alone after all. You're more than welcome to join, if you'd like. Click here for more information or to sign up. Because I already eloquently explained myself last week by vlog, I'm going to re-post here. I did try to keep a brave face on everything, but by the end of the first third or so, I'm basically going into where I really am in my life at the moment. Since I'm just going to let that do the talking for me instead of writing again (because I've *just* managed to not burst into tears at the thought and writing about it again would open the scab, so to speak), I figured I'd answer this month's question for those of you who'd rather not see/hear me. Yes, I have. A long long time ago, I finished a rewrite to a book shortly after I finished rewriting Doorways. For those of you who weren't visiting my blog at that time, The Vanished Knight + The Heir's Choice = Doorways. I was backing up the file for the last time when something (and don't ask me what) went wrong. The entire file disappeared, replaced with an empty one of the same name. I was heartbroken. So much so that I decided to just shelf the whole project until I could look at it without mourning the project I'd had. It took about five years before I decided to look at that thing again, and by then, I'd grown so much as a writer that I ended up redrafting the whole thing from scratch, keeping only the characters and about half of the concept. Any you know what? I love it even more than I loved it before. I've started editing it and working on it with critique partners and they've enjoyed it too.